In the 21st century, Antonin Scalia's head was an Associate Justice of the United States Supreme Court. By the year 3003, he had become an Associate Justice on the Earth Supreme Court. He participated in the cases of Earth v. Zoidberg (4ACV05) and Earth v. Feministas (ITWGY). In 3008, Bender apparently robbed him at gunpoint (ITWGY). In 3003, with Earth v. Zoidberg judges (4ACV05). In 3009, with Earth v. Feministas judges (ITWGY). Ruth Bader Ginsburg's head: Can the witness identify the feminista leader? Bender: That's her right there, with the "I'm gonna kill you, Bender" look in 'er eye. 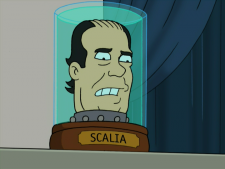 Antonin Scalia's head: Hey, aren't you the robot who robbed me at gunpoint last year? Bender: No further answers, Your Honor. This page was last edited on 20 July 2016, at 01:46.